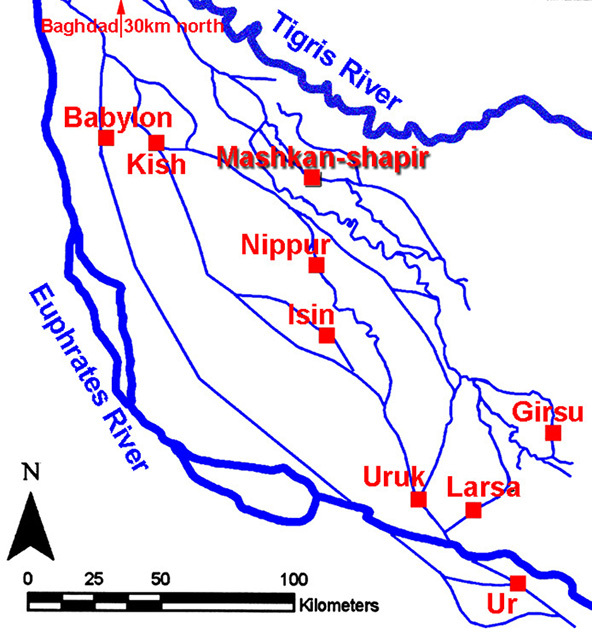 Mashkan-shapir (which means "encampment of the official") is located about 150km south of Baghdad, Iraq, and about 35km north of the ancient city of Nippur and 70km east of Babylon, near the ancient watercourse of the Tigris River (the image at the left shows the major rivers and interconnecting canal systems across which most commerce at the time seemed to move; hover over to enlarge). The marker below points to the location of Mashkan-shapir. About 2000 BCE, during the height of the city's extent, it was the second capital of the Kingdom of Larsa. 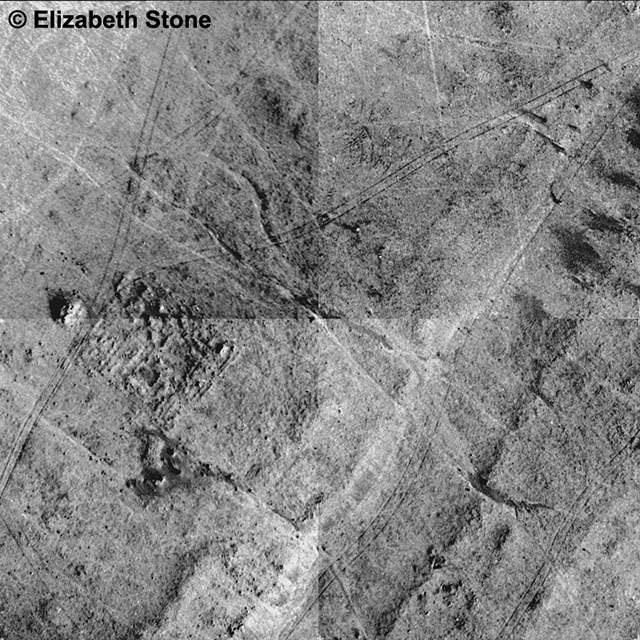 Mashkan-shapir seems to have been abandoned about 200 years later, and generally left untouched until a survey and partial excavation took place under the direction of Elizabeth C. Stone and Paul E. Zimansky, from 1987-1990 (an image of the site from the surface survey is at the left; hover over to enlarge; image © Elizabeth Stone; used with permission). The remains of a large city were discovered through excavation, surface survey, satellite imagery interpretation, and aerial photography using a camera-bearing kite. Mashkan-shapir was an urban center quite unlike what had been our presumed view of early-second-millennium southern Mesopotamian cities (see the regional context view at the left; hover over to enlarge). The extent enclosed within the city walls (apparently built by the Larsa king Sin-iddinam, who reigned only from c.1845 to 1843 BCE) is more than 70 hectares (about 170 acres), making it (at that time) larger than the enclosed area of Ur. Investigations have revealed that the city was divided into distinct functionally separate precincts by a series of canals and two harbors, including areas for manufacturing, religion, residences, city administration, a large garden, and a cemetery. Mashkan-shapir did appear to be typical in that it had a circuit wall and few city gates, a clear temple platform, and large residential areas (hover over the plan to enlarge). What was not expected before detailed site exploration was that the city had lots of empty space between the line of the city walls and the occupation areas inside, that there were so many canals and large harbors within the walls, and that the city was thus probably more lush and full of water than we normally expect from settlements of the ancient Near East. The city seems to have been built to focus more on water traffic and commerce than on transport by roadway, given that many of the residential areas and interior roads align themselves to the major canals or congregate around the harbors. 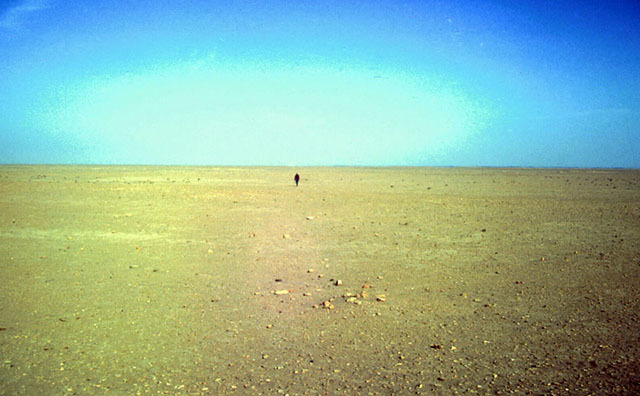 As a result of the general lawlessness in the countryside following the US occupation of Iraq in 2003, the site has since been completely destroyed by gangs of roving looters, leaving nothing but hundreds of empty potholes in their wake. The Institute for the Visualization of History (our sister organization to which we lend our modeling expertise) was approached by the Dalton School (New York City) to build an interactive teaching package focusing on a 2nd millennium BCE Mesopotamian urban center for use in the School's 5th grade classes. Mashkan-shapir was chosen, because: the site is essentially a single-period site, thus having no superimposed rebuilding phases and little architectural change from the time of its time of greatest extent, and it has been completely surveyed and studied (a sample aerial photograph at the left, taken during the initial survey and before the site was looted, clearly shows the remains of an adiministrative building, several outbuildings, a canal [angling up along the right edge], and levees right at the surface; hover over to enlarge). The Dalton School wanted a series of 3D digital reconstructions to help students envision what an emerging urban center might have looked like. 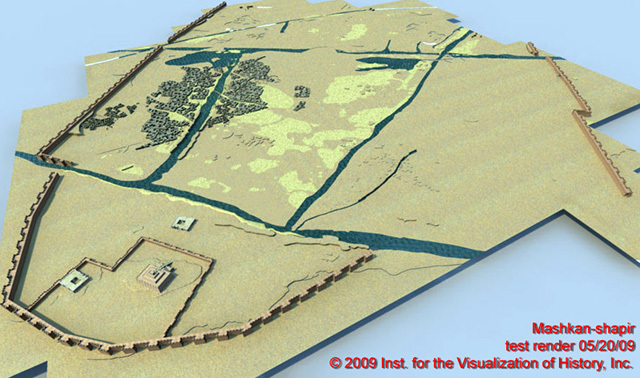 The visualizations were to be provided in a module suitable for student or teacher navigation of key urban areas and presented in a manner that could be used in conjunction with elementary school instruction on ancient Mesopotamia. The preliminary data upon which our models were based included the aerial photographs, site grid-plans, and the site-walking survey results and interpretations. Not all of the city had been excavated, only selected small portions of the vast settlement. Thus, for specifics about the city s architecture, roads, and waterways, we had to rely on the investigators' detailed interpretation of aerial photos and their walking survey of the site. In order to fill in information that was not directly available from Mashkan-shapir, we and the Dalton School staff decided to look for another site comparable in time, location, and layout for parallels we could use to complete our 3D re-creations (a rendering of the early massing model is at the left; hover over to enlarge). We chose the city of Nippur (only 35 km south of Mashkan-shapir) as our parallel site for several reasons, but key among them was the discovery at the site of an ancient plan of the city. This ancient plan, apparently etched to scale in clay and drawn about 1500 BCE, during the Kassite period, shows in detail the layout of the major city features, including canals, temples, and city walls. 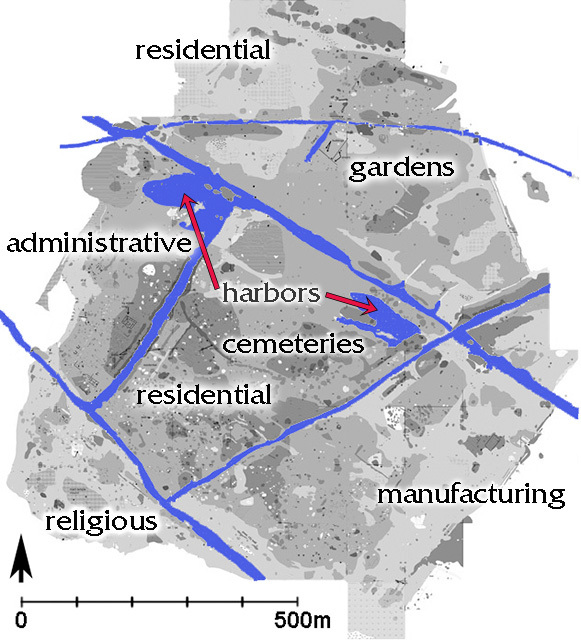 All of those elements (and their relative locations) parallel similar urban features at Mashkan-shapir. 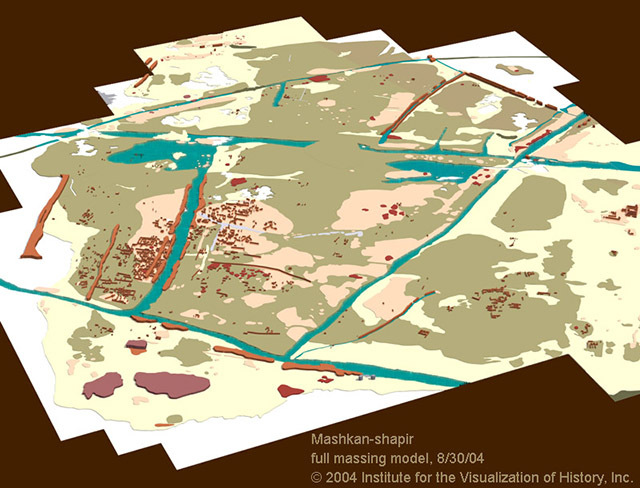 Upon comparison with the excavated evidence from Nippur, certain sectors of Mashkan-shapir were compared to the Nippur map and then modeled to match the evidence as closely as possible (a rendering from a more advanced model of the site at the left; hover over to enlarge). 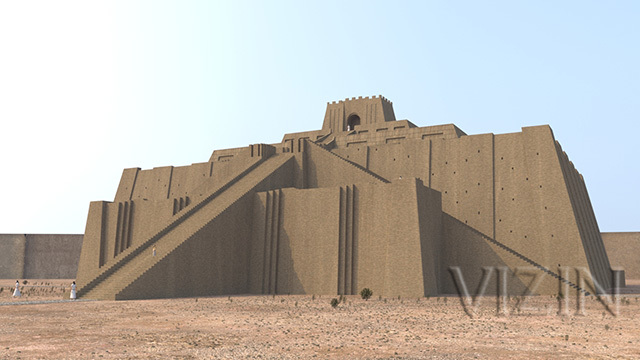 The ziggurat as we have reconstructed it, based on the ziggurat at Ur. 2008 "A Tale of Two Cities: lowland Mesopotamia and highland Anatolia," pp.141-64 in The Ancient City: new perspectives on urbanism in the old and new world, edited by Joyce Marcus and Jeremy A. Sabloff, Santa Fe, NM: School for Advanced Research Press. 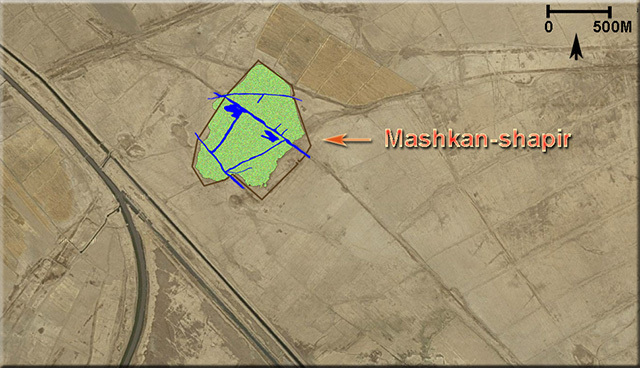 2004 The Anatomy of a Mesopotamian City: Survey and Soundings at Mashkan-shapir. Winona Lake, IN: Eisenbrauns.